There is nothing quite like natural stone tile. Marble, granite, or travertine is not only breathtaking in appearance, it is also a sound investment in the future value of the property. However, the key to making this investment worthwhile is locating a source of material that is affordable. Natural stone is expensive unless purchased in bulk quantities. The material must be extracted, cut, shaped, and polished or honed. It must be carefully packed, shipped with care, and delivered on time and on schedule. This process is affordable if the buyer chooses to obtain the product from a direct importer and distributor specializing in wholesale flooring tile. Stonexchange is a Miami-based importer of marble, granite, travertine, and paver stones. We own and operate our manufacturing facilities located overseas near the actual quarries. Because we carry out our own shipping and distribution procedures, we save our commercial clients a great deal of money on top-quality natural stone material. Getting the price down to a reasonable level is difficult unless the product is sold directly to the end-user. At Stonexchange, we accomplished this by shipping vast quantities of material to our Florida distribution center on a constant basis. We sell full-crate orders to home improvement chains, independent contractors, and flooring product retailers. Our company specializes in flooring products including tile, insets, and transition saddles. Our products are expertly crafted, cut and shaped to exacting standards, and packaged in large quantities. This is good news for buyers needing plenty of material to complete an interior flooring project. Stonexchange maintains a large inventory of interior floor tiles throughout the calendar year. This means that dealers, merchants, subcontractors and independent installers can obtain the world’s finest natural stone product without having to wait months for their material to be delivered. We partner with several overland freight companies and deliver our material throughout the continental United States, with most orders filled, processed, and shipped within just a few business days. Marble is one of the most popular flooring tile materials. It beautifies a room, complements other accent shades perfectly, and helps keep building interiors cool in the summertime. It is also easy to maintain, and the floor will last for decades without signs of fading or discoloring. Our company offers a wide range of marble styles and color patterns. Among the most popular are Crema Marfil, Nuevo White, and French Pattern. These tiles are available in the standard 12-inch squares, but buyers can also request larger sizes. We ship our marble tiles in full-crate loads, with a minimum piece requirement. We ship to flooring product retailers, home improvement stores, and even to job sites. Interior designs can be quite complex, with several different styles of marble specified in the building instructions. The floor tiles can be of a neutral, medium shade, intended to complement the colors used for the kitchen backsplash or countertop. Stonexchange will organize and deliver a mix-and-match bulk order of several different shades if the customer wishes, and we do not charge extra for the processing of these orders. We also do not charge extra for non-standard size tiles. Travertine has been used for more than 2,000 years as a material for interior floor and wall surfaces. This limestone product is the result of natural geologic processes involving the seepage or percolation of contaminated water through a sedimentary rock layer. The stone is famous for its color striations and mottled appearance. Although brittle-looking, travertine is actually quite strong. Tiles made from travertine are usually honed and filled, with the highest grade of stone having been given a coat of sealant to make it weatherproof. Travertine is rather dense, making it expensive to ship unless it is purchased in bulk quantities. Stonexchange offers the best possible wholesale price on full-crate or full-pallet orders of ivory or dark travertine tiles. 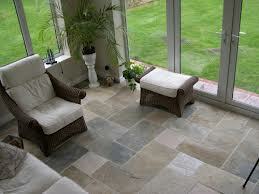 Travertine is often used to cover the surface of an atrium or sun room. It is also popular as a wall covering for bathrooms and as a material for kitchen backsplashes. Stonexchange not only carries the popular 24 X 36-inch tiles, we also supply our commercial clients with insets and mosaics made from travertine, and mosaics constructed of travertine, ceramic, and glass. Granite is formed by igneous processes involving a combination of high heat and high pressure. The result is a very dense rock, a bonding of quartz and biotite. Granite is favored as a flooring tile in the bathroom, around a fireplace, and in an entryway foyer. Galaxy granite is an industrial term for the darkest shade of this natural stone. Our Absolute Black Granite is the perfect replacement for installations calling for the use of Galaxy or similar shade granite tiles. We also supply our clients with countertop material including corners and bullnose pieces. Granite is usually given a high polish. It can also be honed to cut down on its light-reflective properties. We ship this beautiful stone product in full-crate quantities throughout the continental United States. Installers often have a difficult time locating suitable thresholds for home interiors because the color shades will not match the marble, granite, or travertine tiles purchased elsewhere. Stonexchange solves this problem for those looking for a perfect shade match. Our beautifully crafted thresholds are manufactured from material taken from the same quarries as our tiles. The result is a perfect color match between flooring tiles and thresholds. Home or office interiors containing both stone tiles and carpeting usually have threshold saddles placed in doorways and at the entrance to a bathroom. It is imperative that the color shades of the tiles and thresholds match, and Stonexchange offers the same styles and colors of marble and travertine thresholds to match our flooring tiles. Remember that these products can be ordered together and shipped directly to any location. As with our flooring tiles, the transition saddles, shower curbs, and window sills are sold with a minimum piece requirement. This saves the customer money from the start, and bulk orders also ensure that the client will have plenty of placement pattern choices. Stonexchange oversees the entire fabrication, shipping, quality control, and delivery operation on all of our products. We guarantee our customers the finest quality flooring tiles and accessory items, and we are proud of our customer satisfaction history. Our products are carefully packed onto delivery crates to minimize breakage during transit. Commercial clients needing a large quantity of material can set up a recurring order schedule with Stonexchange. Our popular items are available year-round, with no lead time required for processing and shipping. A large construction project may involve a line of credit on the part of the subcontractor. This means that several different orders, perhaps consisting of more than one type of tile product, are placed during the successive phases of the building project. Clients can separate their order into several deliveries to meet their budgeting schedule. This is of great relief to independent installers, who know that the product required for the building phase will arrive on a specific date. Everything about our company’s shipping and delivery operation is geared towards satisfying the client’s individual need. Flooring tiles and accessory products are not cheap, and it is imperative that dealers, retail merchants, and construction contractors find the best possible price on natural stone tiles for interior floors. Stonexchange is in business to help merchants pass the savings on to their own customers, and we offer the best possible wholesale price on top-quality natural stone tiles. For complete information on our line of products, our order requirements, and our shipping policies, contact us and talk to our knowledgeable sales staff. Stonexchange is a premier importer and distributor of natural stone tile, and we offer the very best prices in the industry along with the most reliable delivery service in the entire nation.